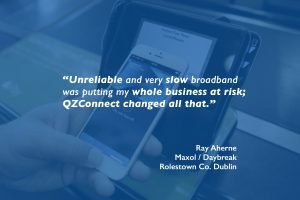 QZconnect specialises in delivering Managed Broadband Services to Irish retailers. 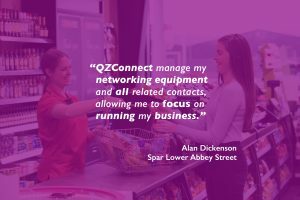 QZ Connect networks support all the equipment that a retailer requires to do business. QZ Connect supply the hardware, network and support. Our services are fast, robust and cost-effective. At its simplest, we aim to deliver a solid and reliable broadband service, fully managed by us so you can forget about it, but we also aim to deliver a clean networking environment that caters for all of the in-store equipment, now and in the future, that may require connectivity. A key driver for this is that the retail environment is becoming far more dependent on an array of technology that must all communicate with the outside world, some requiring kid gloves and tight security, and some being reasonably robust. If rationalised for economy on the telecommunications connection, this creates a single point of failure, scope for equipment to interfere with other equipment, and a potentially awkward and expensive diagnostic process if and when something goes amiss. We aim to address all of this by providing a reliable, secure and resilient telecommunications hub, which can deliver remote diagnosis and management, backed up by a managed service that gives the retailer peace of mind, takes the drama out of support, and should make the lives of all concerned that little bit easier. We also deal with the reality that Telecoms providers are simply not geared up to provide the kind of support that businesses need when something goes wrong.